The Holodomor was the great famine that decimated the population of Soviet Ukraine in 1932/1933, and given that it was deliberately planned and engineered, is regarded by some as one of the worst genocides of history. The memorial, first opened in 2008, is one of the newest additions to Kiev's dark portfolio. More background info: The word “Holodomor” is usually translated as 'hunger-extermination' or some variant thereof and refers mainly to the Great Famine of Ukraine in the years 1932/1932. There was also a precursor of an engineered famine in 1921/1922 (in the wake of the Russian revolution and civil war, the subsequent Ukrainian War of Independence and general Bolshevik suppression of Ukrainian nationalism) and another famine occurred post WWII in 1946/1947. These are also commemorated at this memorial. However, the emphasis is definitely on the main period in the early 1930s. The famine was man-made, not the result of a drought or a catastrophic crop failure within Ukraine. After all, fertile Ukraine was regarded as the breadbasket of the Soviet Union (and still as a breadbasket of Europe). Part of the cause of the famine was the massive programme of enforced collectivization in the newly established USSR, which affected the Ukrainian peasantry especially hard. However, by 1931, collectivization was already largely complete. Yet its after-effects may certainly have played a role (together with the inefficiency of the new food distribution provisions). Another, and more definite factor was the unrealistic grain quotas that the planned Soviet economy was demanding from of Ukraine. The accusation is of course that this was deliberate, ordered by Stalin himself in order to suppress and decimate the Ukrainian peasantry, which he perceived as a threat to the Soviet Union. This is also where the claim that this was a genocide comes from. If the famine was indeed intentionally planned to specifically target Ukrainians, then this man-made disaster does indeed fulfil the UN criteria for a genocide. The element of ethnic cleansing is also corroborated by the fact that the formerly Ukrainian areas depopulated by the famine were then repopulated with resettled ethnic Russians. Of course, the Soviet Union suppressed information about it (unlike in the early 1920s), didn't permit any foreign aid, and in the subsequent decades, even after the Stalin era, never allowed the issue to be discussed, let alone be called a genocide, at least not until the later stages of Glasnost and Perestroika. Even today, only a couple of dozen countries recognize the Holodomor officially as genocide. These are mostly countries in the Americas as well as former Eastern Bloc countries and ex-Soviet republics (especially the Baltic states and Georgia, not surprisingly), although a couple of Western European states (and Australia) are also amongst these states. Russia, on the other hand, still claims that the famine was part of a larger catastrophe that afflicted the USSR as such, not just Ukraine in particular. Given the current political climate between Ukraine and Russia, it's to be doubted that the latter will change its position on this any time soon. The Ukrainians, however, can also point to yet another factor underpinning the genocide claim, namely that the starving masses of peasants were denied the possibility of going to look for food elsewhere. They couldn't buy train tickets, and the borders were sealed off and guarded by the NKVD (precursor of the KGB). Anyone caught trying to flee was either imprisoned (possibly in a Gulag) or sent back to their villages (where most then starved to death). The terror regime of the Soviet authorities also included drastic rules, e.g. even picking up grain that had been dropped on the ground during the harvest and keeping it for oneself was regarded as theft of kolkhoz (collective farm) property and carried a non-pardonable 10 year prison sentence. This became known as the “five ears of grain” law, decreed by Stalin. The extraction of food from Ukraine did not just include grain. Farm animals and foodstuffs kept at home were also confiscated and shipped out. In their desperation, people resorted to eating dogs and cats … and even cannibalism was apparently rife. Needless to say, children were especially vulnerable and counted disproportionately amongst the victims. Since the death rates were not precisely recorded (though a lot has been reconstructed in hindsight more recently), the estimates of the total number of victims vary enormously. Figures one can find range from between 1.5 million to something exceeding 20 million. More modern and more restrained estimates now put the number more in the region of 3 to 5 million. Another factor in this uncertainty in the death toll is also whether only deaths within Ukraine's (then) borders are counted or whether ethnic Ukrainians outside these borders are included. The count goes up significantly if the north Caucasus region of Kuban, where the famine raged especially harshly, is included. What ever the (disputed) figure may be, it is clear that the Holodomor was one of the most tragic cases of mass death in the history of the 20th century, if not world history at large. Yet it is not very well known in the outside world. What there is to see: The memorial site consist of various parts. In the centre of it all is the main monument. This has the shape of a white stylized (octagonal) candle with a golden “flame” of gold leaf at the top. On four sides there are large crosses made from black iron bars. In front of three of these crosses stand blocks of stone with the years 1921-1922, 1932-1933 and 1946-1947 engraved on them, respectively, i.e. the periods of the three famines of which the middle one was the worst. At the centre of the crosses golden birds with spread out wings (storks?) face upwards as if in vertical flight towards the heavens. The latter theme is picked up by a rather odd sculpture on the side facing the museum entrance: here the golden bird's wings appear to be stuck inside two rough stone columns. There's probably some symbolism to this, but it eludes me. Opposite this sculpture (on the roof of the museum entrance, that is) is another piece of art, in which more iron bars enclose an S-curved arrangement of short brass “stubble”, probably (though I am far from sure) to symbolize the stolen grain taken out of Ukraine (see background). On the slope facing the river is the so-called Black Board Alley, which consists of black stone plaques listing the names of thousands of villages affected by the famines. On the other side an alley connects to the main road leading past the memorial and the park (Lavrska Street). At the junction, the entrance to the park/memorial complex is flanked by stones stating 1932 and 1933 and two solemn sculptures of kneeling angels. Dotted around in a circle are stylized millstones (probably to say “no grain to grind”!). In the middle of that circle, about halfway to the main monument and the museum stands a small, slightly more than life-size statue of a little girl. She's thin, barefoot, in a simple gown and is looking dejectedly to one side while clutching a bundle of five ears of grain in her hand. People often place sweets or apples at her feet or in her hands in tribute. The museum part is underneath the main monument, and it's the only part where you have to pay an admission fee, which was but a pittance. I declined the significantly more pricey guided tour offered and instead just looked around independently. The main room, or Hall of Memory, consists of one large circular space, subdivided into different sections, though the borders between them are rather fluid. The main feature in this rather dark hall are the video projections onto the curved wall. 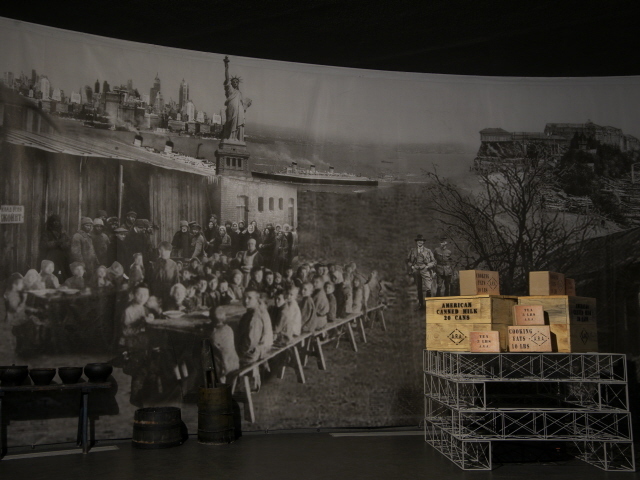 What you get to see is partly just moving names against black background, or bits of film footage and photos from the famines, accompanied by English-language subtitles making the narration accessible to non-Ukrainian speakers too (these are composite projections that are not always perfectly synced, so the lines of the subtitles may appear a bit “broken”). Otherwise there is no English labelling or text. But there wouldn't be all that much to label anyway. This is really more a memorial than a museum. Between the outer and inner circle are just a few text-and-image panels that appear to lay out some historical background and point out important people involved (spot that Stalin!). Visitors are also not spared some rather gruesome images of starving or already dead victims. Part of the exhibition are also two interactive screens, supposedly making more information available in three languages, Ukrainian, Russian and English. But when I was there (May 2015) I checked them out and the English and Russian options didn't work. (The same is true for much of the memorial's website, where most documents in the database are still not available in translation). The whole hall is rather dark (so you can see the projections OK) except for the very centre of the hall, which opens up to the inside of the main monument and thus lets daylight in. 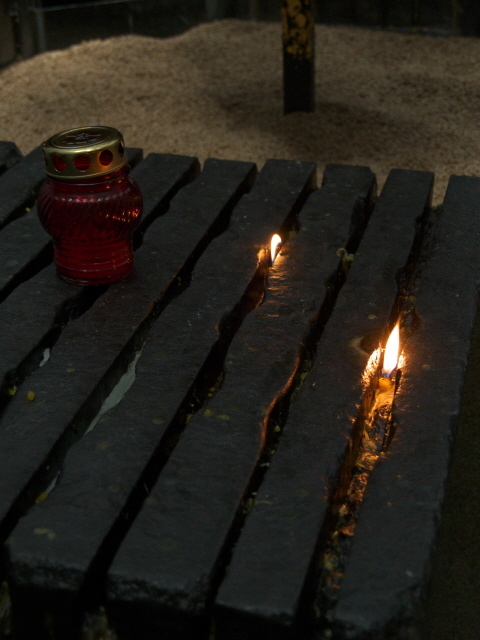 This is also the shrine part of the memorial, where you can light candles. This altar-like spot is accompanied by yet more statuary (including what looks like a male counterpart to the little-girl statue outside). At the back of the memory hall a doorway leads to another opening, with a view over the river. Here, a bell hangs from the gateway, so I guess visitors can go and ring it … or maybe it's only used on special days. If you went out here you'd come straight to the Black Board Alley (see above). A side room branching off from the foyer by the entrance also had an extra (temporary) exhibition when I was there (May 2015), but its text-and-photo panels were entirely in Ukrainian only. I could make out that it was about deportations and Gulags, but I didn't stay to try to decipher the details of the main texts. All in all, this is really more a memorial with an emphasis on atmosphere and symbolism rather than information/education. Some of it I found a little too much leaning towards either the tear-jerking side of things or a bit much of guilty-finger-pointing in the direction of the USSR (and by historical implication that might include Russia too). But it is certainly worth a short stopover visit en route when walking down to Rodina Mat. Location: ca. 1.5 miles (2.5 km) south-east of the Maidan in Kiev's city centre, between the Pechersk Lavra (cave monasteries) to the south and the Park of Eternal Glory/war monument just to the north. Access and costs: Slightly out of the city centre but not difficult to get to; outdoor parts are free, the museum is cheap. Details: To get to the memorial complex you can walk from the city centre along a mostly very pleasant route – it's roughly halfway to the Rodina Mat and war museums further south. The closest metro station is Arsenalna, about two thirds of a mile (1 km) to the north-west. To close the gap you can take bus 24 or trolleybus 38. (Bus 24 also goes all the way from Khreschatyk and the Maidan). The outdoor parts of the memorial are freely accessibly at all times. Opening times of the museum: Tuesday to Sunday 10 a.m. to 6 p.m. Admission: 5 UAH (students 2 UAH), free on Tuesdays. An extra fee for a photo permit is levied at 10 UAH (but given the low light inside, it's not easy to get decent images!). Guided tours (departing every hour) cost 50 UAH in Ukrainian, and 100 UAH in English, German, Russian, French. 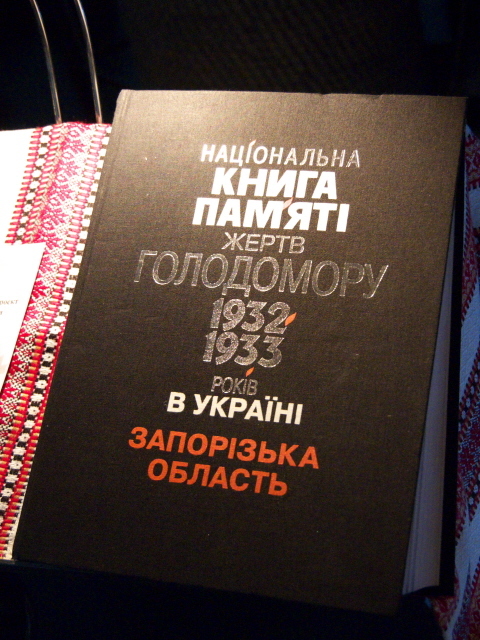 Time required: not long, unless you have a special research interest in the topic and can read Ukrainian/Russian. Otherwise about half an hour in the museum will do (if it includes watching the whole 20 minutes of video projection – otherwise even less), plus extra time for viewing the open-air parts. Combinations with other dark destinations: The Holodomor memorial is right next to the Soviet Eternal Glory war monument and eternal flame … where I still saw wreaths in the colours of Russia's flag (despite the current conflict in eastern Ukraine). And to the south the park's immediate neighbour is the large Pechersk Lavra monastery complex (with its mummified monks in underground passages). Further south from that, also still walkable, is the huge landmark Rodina Mat statue and the war memorial complex and museums. See also under Kiev in general. Combinations with non-dark destinations: see under Kiev. The parks in the vicinity of the memorial are a hub for people meeting in the open air. And as so often is the case at war memorials in the former Eastern Bloc, the spot is especially popular with wedding and hen parties. So you can get treated to some interesting people-watching opportunities here!